Queenslands’ motorcycle friendly town, Crows Nest, is set to host the Australian V-Strom Riders (AuStrom) 2nd Birthday Roundup event this coming March, and it’s going to be big! AuStroms’ inaugural Birthday Roundup held in Walcha in 2017 saw an attendance of 40 riders, with this year’s event tipped to see more than double that number. The organisation of this year’s event endeavours, led by founding members Mark Ferguson and Graham Strang with fellow member Bill Venture, has seen quite the collaboration of ideas, backing from sponsors and most importantly the support of a great country town community. In the run-up to cementing the birthday celebration destination, Bill and Mark proceeded on an excellent adventure visiting the town of Crows Nest, inspecting the variety of accommodations available to encompass the expected comforts of the riders. Visiting the hospitable local caravan park and hotels provided a great insight to the range of tidy and value for money options for riders to lay their head for the night. With the samplings of a beer or two, the decision was made that Crows Nest was indeed the place to hold such a celebratory event, especially with the town’s all-round warm biker friendly atmosphere. 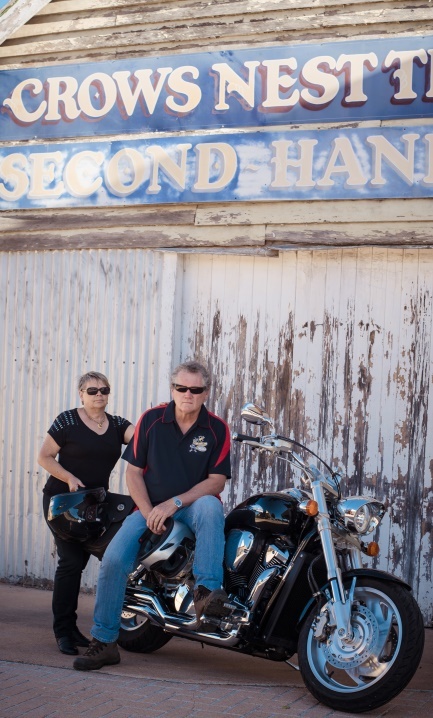 Graham Moore, avid motorcyclist and rumoured Tai Chi instructor, is one of the driving forces behind Crows Nest becoming Australia’s fourth town to be recognised as a motorcycle-friendly town. 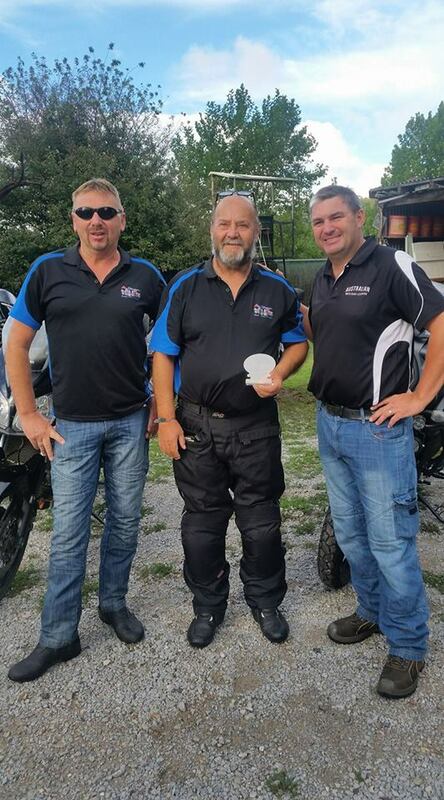 Combined with the support of local businesses and friendly community spirit, Graham has brought together the opportunity for Crows Nest to shine in showing the motorcycling community their welcoming hospitality. It is this supportive biker friendly movement that is creating opportunities for locals and tourists alike to connect and catch a glimpse of that great biker spirit. Now tell me, what biker doesn’t appreciate a good coffee or a cold beer when out on a ride? This is where it ties together the community, businesses and bikers alike. Now what’s in store for the three days of celebration you ask? The AuStrom team has been working tirelessly for the past several months with the tremendous support of Suzuki Australia, bringing together an impressive array of raffles, member awards, organised group rides, pre-planned lunches and dinner events (it is reported there will be cake!) and a general all-round opportunity to catch up with fellow Strom riders, to tell a good story or two. Plus, attendees will be in for a very pleasant surprise kindly organised by Stuart and Grant of Elite Motorcycles Toowoomba. Friday the 16th kicks off the event with a meet and greet at the Grand Old Crow Hotel, with the option to pre-book dinner at $10 a head in the form of pizza or a hot and cold platter. A pretty good deal if you ask me, especially after a long ride, and more so when accompanied by a nice cold beer! Saturday sees an impromptu start to the day with a meander of Crows Nest to find your choice of breakfast, followed by a coordinated group ride to Wivenhoe Dam with options of heading there by bitumen or dirt. The choice is yours to decide how adventurous to be on the day. Saturday night brings together the focus of celebrations around dinner, the chance to win a raffle or two and the highlight of the night, the presentation of the AuStrom Member Awards. This year recognises previous Member of the Year award winner, the late Peter Coote, founding member, and damn decent bloke to all who knew him, having this award now titled the ‘Peter Coote Member of the Year Award’. I believe this year’s winner, as part of being the prestigious holder of the title, is entitled to a glass of scotch and a big slice of cake, just the way Peter would have ideally celebrated. Cake anyone?! After a great night, Sunday brings us to the final day of celebrations. Whether we welcome the day with bleary eyes and smiles or refreshed and ready for the ride home, it is certain that everyone will have many great memories and stories to take away with them. So, how do I join in the festivities? For more details on how you can be part of the AuStrom 2nd Birthday Roundup, please visit the AuStrom Riders website here, where you can register for the event, pre-book for lunch and dinner and buy AuStrom event merchandise. So come along, get to know the members of AuStrom and their great mateship, and even be ever so slightly persuaded to see just how much fun being an Australian V-Strom Rider really is.